Last Saturday, we were invited to an open playtest by Four Fine Fellows, a local game design company in Eugene. This event was both informative and inspirational. 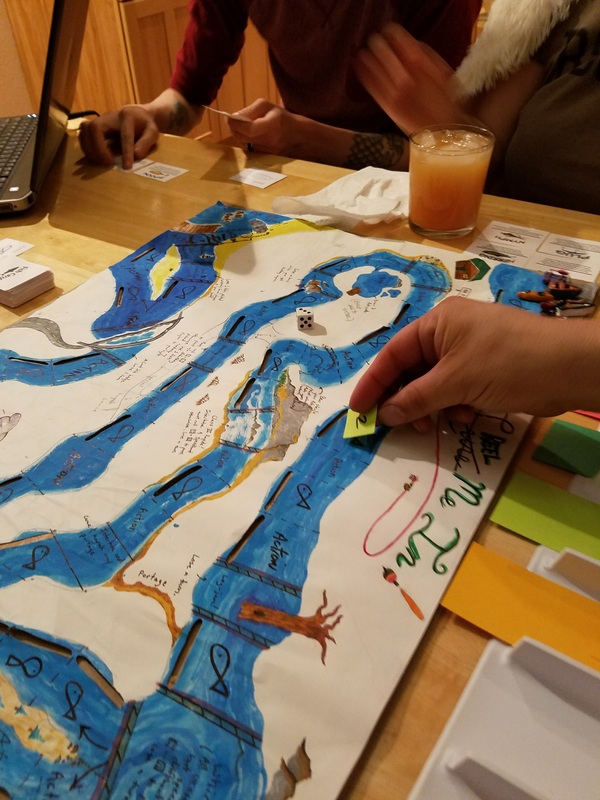 We got to playtest a handful of games, in various stages of development, by local designers, as well as chat about marketing, production and distribution. We were hoping this experience would allow us to judge the progress of Reel Me In, and boy did it! First-time designers attended the event, as well as two videogame makers, four seasoned game-makers with over twenty games in production, a role-playing creator, and of course Gil, Shelly and I — the Merry Gamesters. Everyone was excited to play and give feedback. A lively buzz permeated the air – the thrill of being one of the first to sample a game that may, or may not, ever hit the shelves. The first game, Lands and Lore’s Athaneos, looked complicated at first glance, but after having learned the overall format – somewhat like Risk meets Magic the Gathering – we got to understanding the general principles of gameplay. There are four factions, all seeking to dominate four portals, which, if I remember correctly, are governed by some sort of portal senate, from which cards can be drawn. Now we only got through one round of the phases, but, what I found intriguing about this game, as well as the game that followed, was the existence of a large player card. In this game, the card held territories, among other cards. Another notable element was the possibility of all players taking their actions at once, so as to decrease the downtime so common with phase-turn games. I liked the idea, but I could see how it could get a bit chaotic. That being said, this point was still in development, so we’ll see where it ends up. What struck us the most about this game, when thinking of it in relation to Reel Me In!, was the fact that its production level was beyond ours by quite a bit, but that some fairly crucial gameplay rules were still in transition or not fully decided upon yet. It was almost as if they were taking an opposite approach to ours: production first, mechanics second (or, at least finalized mechanics). Albeit, our game is less complex, but it was fascinating nonetheless. Overall, Atheneos has a tremendous amount of potential, so keep your eye on this one. I think serious gamers, willing to accept a steep learning curve, will love this one. The art is splendid and inviting; the dice-army usage is refreshing; and the concept is lofty, but once finalized, I’m sure it will wow people. Okay, let’s be honest. When someone says, “Well…I’ve got my game out in the car. I could go get it out if you really wanna try it,” you’re probably not expecting much. But, let me tell you, when this developer brought out Pirate PaRRRty! and started setting it up, I was immediately hooked. It was definitely NOT a rough draft, in any sense of the word. 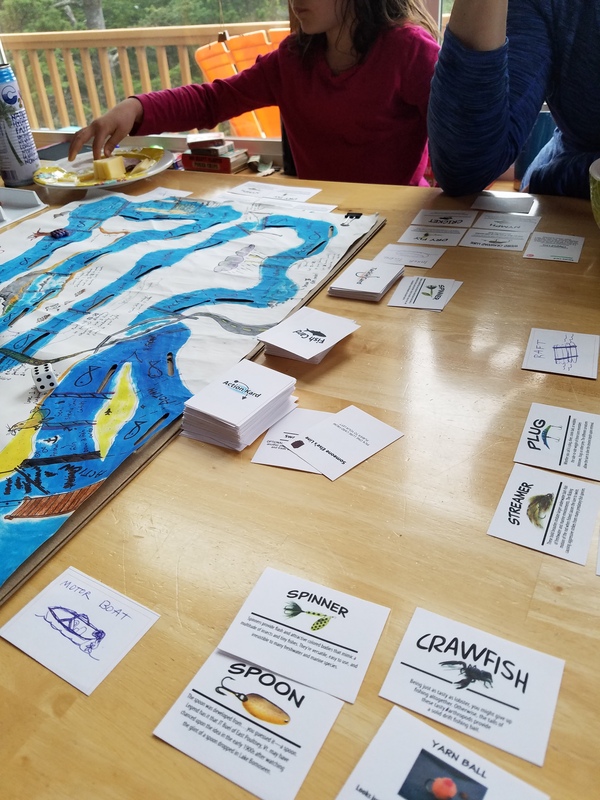 The art and design were badass; the honeycomb-style island-ocean game-board, with some spaces revealed and some left undiscovered, was perfect for the theme; and the team element of boats with three to a team, each person taking on various roles, such as boatswain, captain and swabby, gave the game an individual, as well as cooperative flare. Add to all these the idea of gaining booty and gold to upgrade weapons and ships, and you’ve got yourself a genuine good time spent with shipmates. Gameplay allows for PVP (player vs. player) and PVE (player vs. environment), freeing the game from simple divide and conquer strategies, and making areas of the board open to harvesting of loot and gaining of victory points (all of which are added up at the end of the game). Anyhow, we dueled, ambushed, and fought our way through one or two rounds of this rollicking pirate extravaganza and thoroughly enjoyed it. 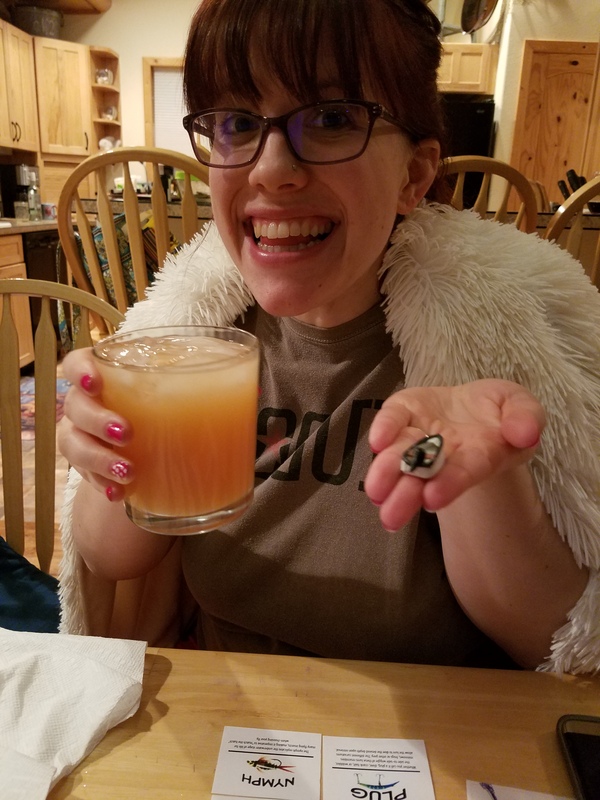 We drank grog, sailed the seven seas, and queried the designer about some sticking points in the mechanics, at which point he gladly obliged by poring over SIX PAGES of instructions!! (Fear not. I’m sure these will be simplified before it reaches your table). I truly can’t wait for this game to come out. It helps that I love pirates. Heck, I probably dressed up as pirate for Halloween four years in a row when I was a kid. It would be a shame if this game never saw the light of day and just sat gaining dust in some desk drawer, like an artifact waiting to be excavated. Because, it truly is, a treasure trove lying just below the surface of the game design ocean. Since it was getting late, we quickly split into two groups and playtested two of the Four Fine Fellow’s games. The one we played was a simple, yet fast-paced card game titled Lines. After having played two complicated and large-scale games, Lines was a breath of fresh air. It was kind of a rummy-meets-poker hybrid with an extra suit (stars) and an extra royal card (Knight), which gave the game a discombobulating, but curious twist. We would have enjoyed bringing our game this time, but, alas, we were unable. Four Fine Fellows hosts the event every second Saturday of the month and we’re confident that we’ll have Reel Me In! ready for playtesting sometime in the next two months. I can’t wait to have some of the fellow designers playtest it, especially considering they were bursting with questions and comments for the other developers that night. 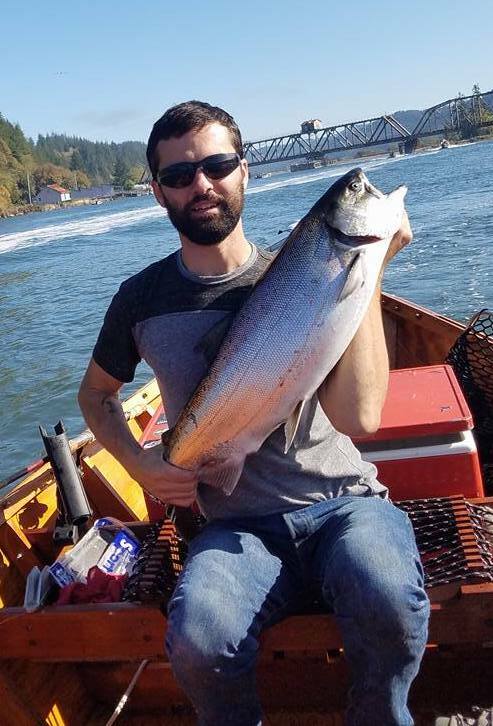 Currently, Shelly and Gil, the artist and graphic designer, are hard at work on the action card deck, which is turning out excellent, with a charm unique to the game and its unusual concept — fishing and gaming. The original rough draft board – which I drew up about a year ago, and has since been severely marked up and edited – is giving way to a more polished prototype ready for playtesting. And lastly, the other avenue we’ve been exhaustively pursuing is pre-marketing. That being said, we’re actively attempting to grow our email subscriber list. So, stay informed by signing up for the email list, as this is the best method for us to let you know about the progress and eventual campaign on Kickstarter. Who knows, maybe YOU will be the next person to playtest Reel Me In! and be able to give valuable feedback. Well hopefully I do get to test your game. and if not that’s ok. also fun that you share your special moments with your fans. These games sound so awesome! And what a fun night getting to playtest new games. Excited to hear more about Reel Me In. The new action cards look amazing! Thanks Sami. It was a blast, and we plan to do it again soon, hopefully with our game sometime this summer. Eventually we’ll be play testing to friends, family and private blind play testers as well. I can’t wait to play this game! The cards are looking great and I love learning in game form. What a great opportunity you guys had to learn about game creations. I’m excited for the group to test yours. Thanks, Denise, and thank you for signing up for the email list. We hope to have a play testing night or two coming up within the next month or two.